Our early-bird offer has now ended but you can still enjoy a discount by buying daily admission & car passes online until up until 2 days prior to the day you wish to visit the event. Please note that discounted Season tickets will close at midnight 28th April. See full details for information on ticket prices below. The price of admission includes the use of unreserved Arena seating only throughout the Dressage days (Thursday and Friday) and the Cross Country day (Saturday). However, in order to watch the jumping (Sunday) grandstand tickets also need to be purchased for both adults and children. (NB. These grandstand seats usually sell out in advance). A vehicle pass does NOT include personal admission for the driver (less Coach Drivers – see below). Coaches will be directed to the Coach Park. A vehicle pass and a personal admission ticket (see prices above) will be required for all occupants. (No charge for coach drivers) Children 12 years & under free. See Coaches for more information. The majority of seats in the Grandstands for Dressage on Thursday and Friday are unreserved and the use of them is included in the price of personal admission. 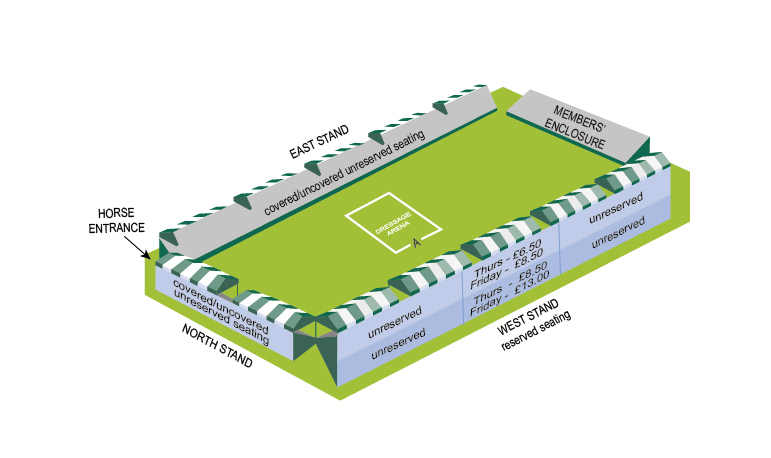 Reserved Dressage Seats may be reserved in the West Stand, close to the short end of Dressage Arena at A. Seats will be available from £6.50 – £13.00 subject to availability. See map below for details of prices. There is no charge for use of the temporary grandstands around the cross-country nor on Sat for those around the Main Arena where the start, finish and first and last fences will be situated. 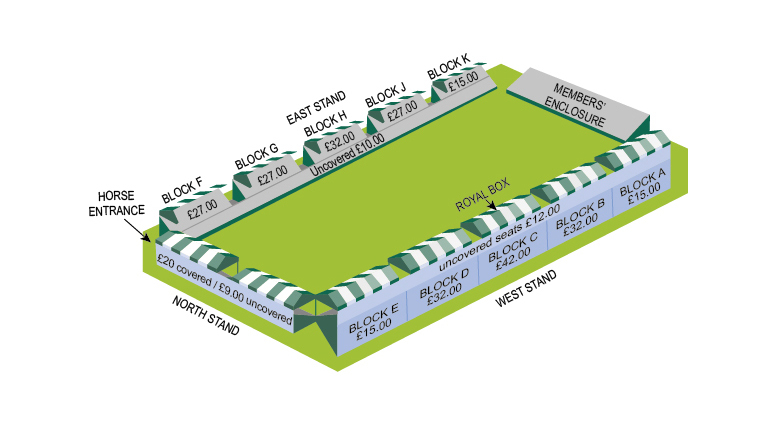 Covered Grandstand Seats will be available from £15.00 – £42.00 (Subject to availability). See plan below for prices. Disabled Car Passes are only available in advance up until Tuesday 23rd April 2019. For full details of our disabled facilities please click here or contact our Box Office. Applications for Disabled Passes will open when our Box Office opens in early January. Fully Catered Hospitality Packages are available in the Portcullis Club which is adjacent to the Main Arena.